After shaking up writing classrooms at more than 450 colleges and universities, Understanding Rhetoric, the comic-style guide to writing that instructors have told us gets "nothing but positive responses from students," has returned for a second edition! 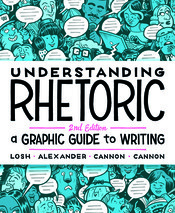 Combining the composition know-how of Liz Losh and Jonathan Alexander with the comic-art credibility of Kevin Cannon (Far Arden, Crater XV) and Zander Cannon (Heck, Kaijumax), Understanding Rhetoric encourages deep engagement with core concepts of writing and rhetoric, as teachers and students alike have told us. With a new chapter on collaboration, unique coverage of writerly identity, and extensive discussions of rhetoric, reading, argument, research, revision, and presenting work to audiences, the one and only composition comic covers what students need to know—and does so with fun and flair. A new "Walk the Talk" feature in each chapter helps students see how to put concepts to use in their own reading and writing. And the detailed instructor’s manual will help both novice and experienced instructors plan a course around Understanding Rhetoric.